PMC-Turbo is a balloon-borne experiment to be launched from Esrange in June/July 2018 on a five day flight over the northern Atlantic to Canada. The mission seeks to study atmosphere dynamics and turbulence in the mesopause region using Polar Mesospheric Clouds (PMCs) as tracers. A set of seven NASA funded cameras will image PMCs (also called Noctilucent Clouds, NLCs) at very high resolution of 3-8 meter per pixel, making it possible resolve turbulent structures at scales of less than 20 meters. While the narrow field of view cameras provide most details, overlapping wide field cameras provide the context for interpretation of the high resolution images. This unique combination allows tracking of features covering four orders of magnitude in spatial scale (~10 m to 100 km). The images will therefore reveal not only small-scale structures, e.g. turbulent eddies, generated by breaking gravity waves, but also signatures of the primary waves, allowing the quantification of processes which cause wave breaking and transition to smaller scales. 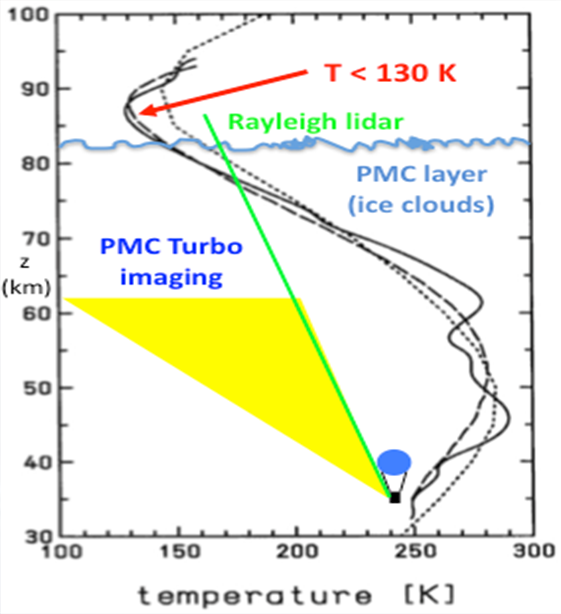 The second main experiment of PMC-Turbo is a high resolution lidar developed by the German Aerospace Center (DLR) Institut für Physik der Atmosphäre. BOLIDE, the Balloon Lidar Experiment, is the first attempt to fly a mesospheric lidar system on a stratospheric balloon. Aimed at 28 degrees of zenith, the lidar will provide backscatter profiles of PMCs at very high vertical resolution of 3 m as well as precise altimetry of the cloud layer. In addition, the molecular backscatter signal of the upper stratosphere and mesosphere will be used to retrieve temperature profiles from the mesopause down to approximately flight level. The temperature measurements will help characterize the gravity waves entering the PMC layer from below.